Before House Republicans left Washington for their August recess yesterday, Rep. Mike Pence handed out his 22-page plan for how Republicans can disseminate their propaganda get their message out to voters over the break. 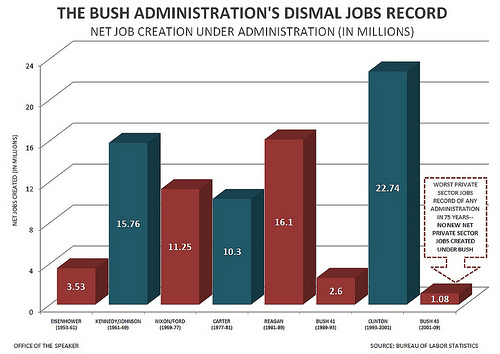 Job creation? If I were a Democratic strategerist, I would have every candidate carry a copy of this chart, and every time a Republican parroted how tax cuts create jobs, throw it in their face and say, ‘Really? What happened here?’. “In order to maximize the size of the cuts, Republicans had to minimize the influence of minority Democrats on the package. So they chose to run the bill through the reconciliation process. But that posed some challenges. Budget reconciliation had never been used to increase the deficit. 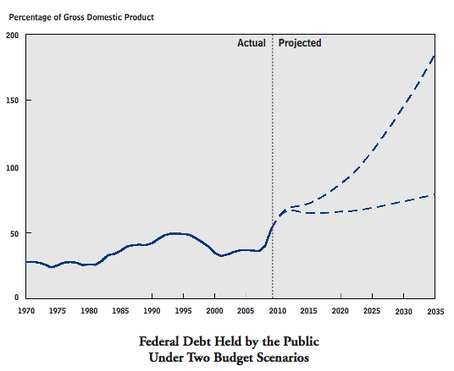 In fact, it specifically existed to decrease the deficit. That’s why one of its rules was that you couldn’t use it to increase the deficit outside the budget window. Republicans realized they could take that very literally: The budget window was 10 years. So if the tax cuts expired after 10 years, they wouldn’t increase the deficit outside the budget window. They’d also have the added benefit of appearing less costly in the Congressional Budget Office’s estimates, as the CBO duly scored them as expiring after 10 years, which kept the long-range budget picture from exploding. Which is exactly what they’re doing now. Oh, but I forgot. Tax cuts don’t count against the debt, just unemployment benefits. Never mind.